PE0279. BRIC-À-BRAC (Lionel Monckton & Herman Finck), recorded 1915, w. Herman Finck Cond. Palace Theatre Ensemble; Walter Jeffries, Teddy Gerard, Murray Johnson, Gertie Millar, Gwendoline Brogden, Nelson Keys & Simon- Girard; Extras by Arthur Playfair, Nelson Keys, Murray’s Savoy Quartet, etc. (England) Palaeophonics 123, w.Elaborate ‘The Play’ 20pp. Brochure replete with numerous photos of the Palace Theatre 1915 production & biographies. Excellently transferred from the legendary Acoustic 78rpm HMV rarities. 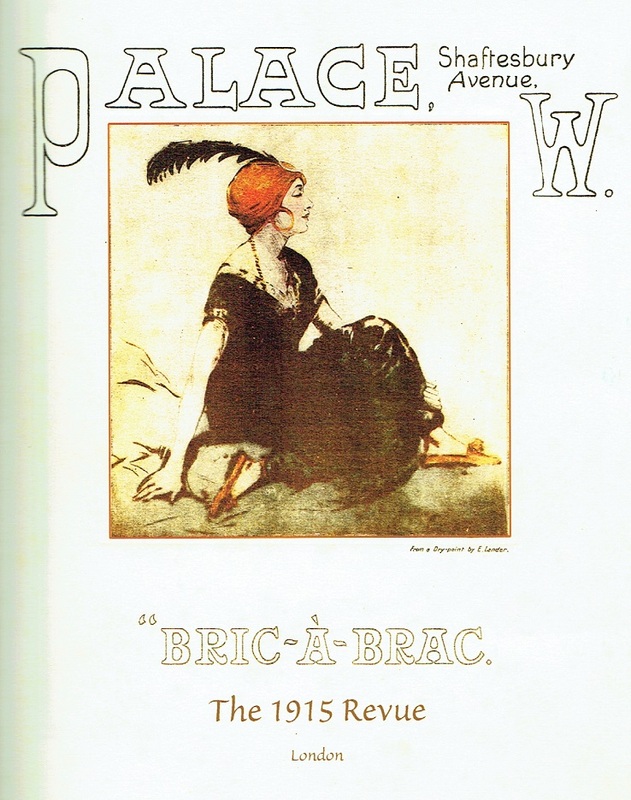 “The most successful revue of 1915 was BRIC-À-BRAC. It opened at the Palace Theatre on 18 September and ran for 385 performances. The revue was originally set to star American Elsie Janis but she had returned to New York and instead it brought from the world of Musical Comedy its biggest star, the enchanting Gertie Millar. She had a strong team with her in Gwendoline Brogdon, Teddie Gerard, Nelson Keys, Arthur Playfair, Lauri Wylie and French light comedian newcomer, Simon Girard. Miss Millar’s husband, Lionel Monckton, wrote much of the music with Herman Finck and the book and lyrics were by Arthur Wimperis and Basil Hood. BRIC-À-BRAC was an extravagant production. Gertie Millar made her first entrance in a setting reminiscent of the many musical comedies in which she had starred. It was a village scene where a local fair was taking place. Among the village folk mingled a handsome Anatole (Simon-Girard) singing of love he had yet to find. Teddie Gerard willingly gave him, and the other available young gentlemen in the crowd, her telephone number in the catchy ‘Naughty, naughty, one Gerrard’. The young squire (Nelson Keys) became interested in a village girl (Gwendoline Brogden) and while love was in the air Gertie Millar made her entrance as Polly Myrtle. Anatole was at once attracted and started a mild flirtation, taking her photograph and telling her ‘now I have two pictures of you, one in my camera, and the other in my heart’. But he had to return to London where Polly had only been once on a day trip - the excuse for her first big number ‘Chalk farm to Camberwell Green’. The scene ended with Gwendoline Brogden’s ‘A hundred years ago’, a piece written to rival her previous hit ‘I’ll make a man out of you’ and the show was already back with the War and the recruiting poster ‘Follow the drum’. Other scenes included a Brighton sea front with a seaside Pierrot troupe, ‘The Incognitos’ in which Miss Millar burlesqued her own singing of ‘Keep off the grass’, the song which had sprung her to fame at the Gaiety in THE TOREADOR fourteen years previously. In the Palace tradition there was a spectacular ballet, ‘La toilette de Venus’ and the closing scene had the artists returning to the characters they had played in the opening scene only it was now set in London and Gertie sang ‘Neville was a devil’. Also in this scene she had her best song, the haunting ‘Toy town’, a song similar to her ‘Moonstruck’ from OUR MISS GIBBS. As a jumping-jack doll with a mass of upstanding flame coloured hair and a stripped black and white dress, she paraded with the sixteen Palace Girls in their toy costumes. The setting had changed to Italy by moonlight with black cypress trees on white marble against a deep blue sky. “Gertie Millar was born in Bradford, Yorkshire, in 1878. She grew up to be tall, thin and attractive with dark hair and large limpid eyes. She was also tough, determined and ambitious. Her stage career began as a singer and dancer in the many music halls of Yorkshire. Later, she moved to London where she was soon topping variety bills, earning substantial sums and attracting much attention. In 1901, George Edwardes (the famous theatre manager and originator of the British musical comedy, who, the previous year, had lost his star, Marie Tempest, after a disagreement over a costume) recruited Gertie Millar to be the leading lady in his productions at the Gaiety Theatre. Her first starring role was in THE TOREADOR. Her next show was OUR MISS GIBBS that opened at the Gaiety on 23 January, 1902. Its strong cast included George Grossmith jr., Robert Hale, Edmund Payne, Denise Orme, Jean Aylwin, Gladys Homfrey and Kitty Mason, but Gertie Millar was, without doubt, the star and made her the best known musical comedy performer in the country. The music was written, in collaboration with Ivan Caryll, by Lionel John Alexander Monckton, an Oxford University educated lawyer turned composer who married Gertie Millar. The hit song of the show was 'Moonstruck', a song Monkton had written especially for his wife. He was to write the music for nearly all her following successes, including her next show - A COUNTRY GIRL (1902) that ran for an astonishing 729 performances. In July, 1903, the Gaiety closed for a total refurbishment. The closing show was THE LINKMAN or, GAIETY MEMORIES. Gertie Millar starred as Morgiana, recreating the part original played by Kate Vaughan in the 1880 burlesque THE FORTY THIEVES. On 26 October, 1903, in the presence of His Majesty King Edward VI and Queen Alexandra, the new Gaiety opened with the premiere of the musical comedy THE ORCHID in which Gertie Millar starred. The show ran for 559 performances. Success after success followed during the next decade. 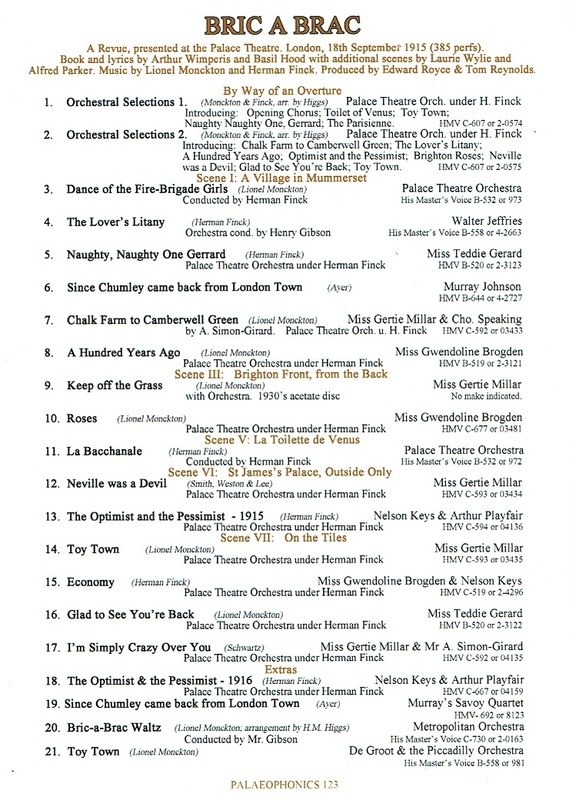 During the 1905-06 season, it was SPRING CHICKEN with music again written by Monckton in collaboration with Ivan Caryll, plus a song written by Jerome David Kern. On 24 November, 1906, Gertie Millar in THE NEW ALADDIN opened at the Gaiety. Gertie Millar was the star with an impressive cast that included George Grossmith Jnr., Robert Nainby, Harry Grattan, Alfred Lester, Edmund Payne and Adrienne Augarde. The show ran until 27 April, 1907. THE GIRLS OF GOTTENBERG, again with Monkton's music (and one of the lyrics by P G Wodehouse) opened at the Gaiety Theatre on 15 May, 1907 and ran till 28 March, 1908. This was followed for the 1908-09 season by A WALTZ DREAM with the music of Oscar Straus. In 1910, Gertie Millar starred in one of the most best-loved Gaiety musical comedies, THE QUAKER GIRL. Her co-star was Joseph Coyne, the American actor who had created a sensation with Lily Elsie in THE MERRY WIDOW (1907). His 'Dancing Lesson' with Gertie Millar repeated the enormous success of the 'Merry Widow Waltz' he had performed in the previous show. THE QUAKER GIRL ran for 536 performances. Gertie Millar's next show, in the spring of 1912, was Franz Lehar's GIPSY LOVE. This was followed by THE DANCING MISTRESS that opened at the Adelphi Theatre in London's Strand on 19 October, 1912. Gertie Millar again was the star with a cast that included Joseph Coyne, James Blakeley, Gracie Leigh, Elsie Spain and Maud Cressall. A great success, the show ran for 241 performances (although, towards the end of the run, Gertie Millar's part was taken by Phyllis Dare and Daisy Elliston).